Should I use MCPBA here? Step-2, This reaction is just made up by myself! I'm using a 'bulky' base to favour elimination. Is this reaction feasible? Will it occur without giving any byproducts? 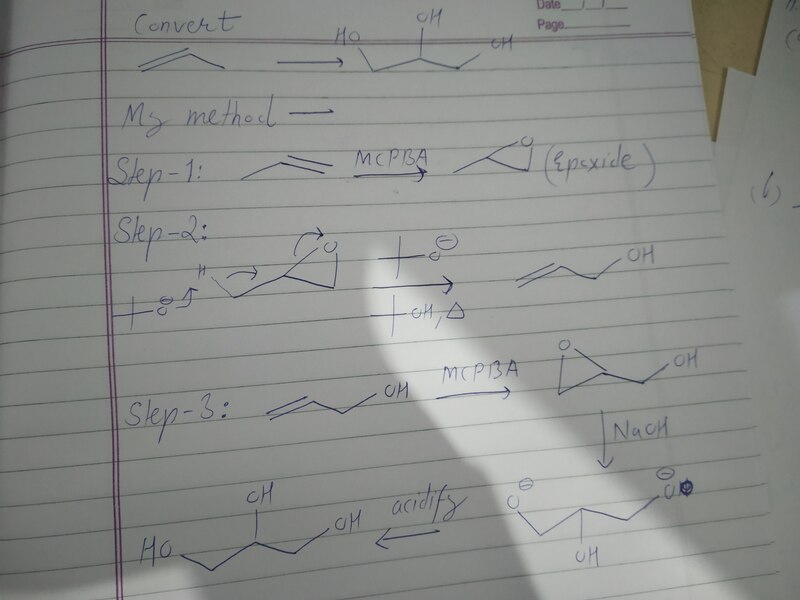 Step-3, Can I use MCPBA to convert an alkene containing an alcohol group to its corresponding epoxide? I'm worried that MCPBA can protonate the alcohol to generate the carbocation (moreover, the allylic carbocation makes it even more probable!) and that will lead to byproducts. Browse other questions tagged organic-chemistry reaction-mechanism alcohols reagents or ask your own question. Why does syn addition of chlorine occur here? can we use con HCl zn amalgam to reduce alcohol? Theoretically, How much HNO3 should we add to 0.21gr of Magnesium? Carbohydrates: What does “typical nature” mean here? Why is the suffix carbaldehyde valid here? What kind of mechanism is adopted here? Why we should concern with A∞?